Iomairt Cholm Cille - Columba Initiative was launched in 1997 by the President of Ireland, Mary Robinson and Brian Wilson MP, Scottish Minister of State for Education, Industry and Gaelic, to foster support for the Gaelic language and develop links between Gaelic Scotland and Ireland. Iomairt Cholm Cille - The Columba Initiative (ICC) was founded to build upon existing cultural links between Gaelic Ireland and Scotland and to develop new ones, with the Gaelic language at the core of all its work. ICC was officially launched in December 1997, following a visit to Scotland of the then Irish President Mary Robinson. The Initiative was then set in motion by the then Scottish Office Minister Brian Wilson. Since then, the ICC has fostered links and funded over 100 projects between the Gaelic speaking areas of Scotland, Northern Ireland and the Republic of Ireland in a variety of areas, including music, sport, heritage, the economy, and many other areas of people’s lives. The projects range from school exchanges and smaller ventures to the large-scale such as the annual student parliament which involves large numbers of Irish and Scottish Gaelic students coming together to debate and discuss of relevance and importance to them. Iomairt Cholm Cille - The Columba Initiative was inspired by the demand from Gaelic speakers in Scotland and Ireland for the chance to meet each other more often, and in so doing to learn more of the language, heritage and lifestyles of one another. This interaction is intended to support Gaelic-speaking communities in Ireland and Scotland in the present and future. Irish Gaelic is a minority language in the Republic of Ireland, but it plays an important role in the identity and culture of the state. Census figures show large numbers having some knowledge of Irish. 1.43 million people claimed to speak Irish at the 1996 census. Levels of fluency and usage vary widely: 5% of the overall population had a high active competence, and a further 10% had good competence, and made regular use of the language. Of the adult population, 71,000 or 3% of the overall population used it on a daily basis, 21,000 of these outside Gaeltacht regions. In Northern Ireland, 145,003 or 9.46% of the population claimed knowledge of Irish Gaelic at the 1991 Census. The figures cover a range of fluency. The main concentrations of Scottish Gaelic speakers are found in the Western Isles, Skye and Lochalsh, Lochaber, Sutherland, Argyll and Bute, Ross and Cromarty, and Inverness. 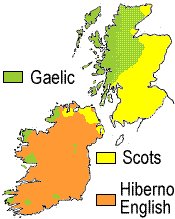 The 1991 census indicated that there were about 67,000 speakers of Gaelic. Gaelic has no statutory legal status, although it is used in some committees by the Western Isles Council. Members of the public can use Gaelic in their dealings with the Western Isles Council and to a lesser extent with the Highland Council. Bilingual signs are also now being used by some government offices in the Gaelic-speaking areas. In 1997 the government-funded Gaelic development body Comunn na Gàidhlig put forward a proposal document calling for ‘Secure Status’ for the Gaelic language. The document was backed by all the Gaelic bodies and signed by many thousands of people. Also in 1997, the UK government signed up to the European charter on Lesser Used Languages. "Our Celtic languages are a precious asset and Gaelic speakers in the [Scottish] Western Isles have long listened to Radio na Gaeltachta, our Irish language radio. More recently, there has been a fruitful co-operation on programmes for both radio and television. Both languages can, I believe, benefit as was said, from the connections being fostered by ICC. The initiative encourages our Celtic language communities to reconnect with each other after centuries when religious and political differences appeared to overshadow their many similarities." ICC aims through its work to facilitate practical co-operation between communities and speakers of Irish and Scottish Gaelic in social and cultural matters, and to identify and develop projects and partnerships in line with the culture of the Irish and Scottish Gaelic communities. The cultural links established by the ICC between the Gaelic communities of Scotland and the island of Ireland can be used to bring economic benefits to both sides, said Scotland Office Minister Brian Wilson: "There is a real potential to use these links to encourage tourism. Cultural tourism is becoming an increasingly important niche sector and one which both Scotland and Ireland should be able to develop to our mutual benefit". ICC is involved in a diverse range of projects. The Fréamh project involves a high quality Gaelic-speaking band from Scotland and Ireland bringing the best of Gaelic music and workshops to remote areas. ICC has also given funding to Leabhar Mòr na Gàidhlig or the Great Book of Gaelic which is brings together the work of more than 200 poets, visual artists and calligraphers - the book has reached out to Gaelic and non-Gaelic speakers alike and has been hailed as one of the most successful arts projects to emerge from the Gàidhealtachd. As well as funding large projects such as Fréamh, An Leabhar Mòr, the Student Parliament and so on, ICC supports a whole range of projects the inspiration for which has come from the Gaelic-speaking communities. Whether it be an exchange between schools or communities, or a drama group from one country performing in the other, these ‘smaller’ projects are just as important in strengthening the links. On a more strategic level ICC was successful in bringing representatives from all three arts councils together to discuss ways in which they could co-operate more. The structure of ICC comprises an Executive Board and Regional Committees in Scotland, Northern Ireland and the Republic of Ireland, each of which draws on a wide range of expertise. The three Project Officers are based in host organisations, which provide back-up and are represented on the Regional Committee and Executive Board. ICC continues to develop strategies in which the Gaelic language in Ireland and Scotland can draw together people from diverse backgrounds, within and between each country and region. The Columba Initiative is a charitable company limited by guarantee which is funded by the Irish and UK governments and the Scottish Executive, and itself funds various projects which strengthen links between Gaelic speakers in Scotland and Ireland. ICC is named after Colm Cille (St Columba 521-597AD), whose monasteries shaped and spanned the Gaelic world of Ireland and Scotland.